"Numark CUE | DJ software for the modern DJ"
The product you can download here is called Numark CUE. It’s a DJ console and mixing software solution which supports a series of Numark hardware controllers. The CUE in Numark CUE refers to preparing a piece of audio or video equipment, setting it a state of readiness to be played. This might sound abstract, but just think of a DJ mixing in a particular part of a song, which of course has to be cued to be started at the desired moment from the exact song position, to fit in the mix. Well, this software goes beyond regular cueing capabilities for audio and video mixing found in similar software. The DJs among you reading this article probably have a dedicated Numark Controller, such as the DMC2, iCDX, iDJ3, MixDeck, MixTrack, NDX800, NS7, NSFX, OmniControl, StealthControl, TotalControl or V7, supported by Numark CUE, or supported third-party hardware controllers from Denon, Hercules, ION, Korg, M-Audio, Pioneer, Stanton or Vestax, among others. 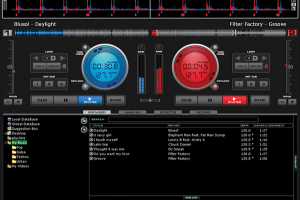 With this DJ software you’ll not only be able to mix, but also scratch, sample and juggle audio and video on its virtual decks. It features virtual crates for your digital audio tracks which means you’ll no longer have to take CDs or vinyl records along with you. Numark CUE features a variety of skins you can select form to suit your mixing needs and setup, supports digital audio and video formats such as MP3, MP3Pro, WMV, WMA, WAV, AIFF, MP4, M4A, OGG, ASF, ACC, DIVX, MPEG-1,2,4, AVI and others. Furthermore, it also supports Virtual Studio Technology (VST) audio plugins and MIDI controllers such as the aforementioned ones. Moreover, its feature list is impressive and too exhaustive to even enlist here, so you’ll have to proceed to the download to find out more details. So, you might want to download Numark CUE to use with your controller, but you should know it is in reality Virtual DJ repackaged. The latter can be found elsewhere on Winportal and has been released in many versions and names over the years, Numark CUE being one of them. Nevertheless, as of Virtual DJ 8, all are unified under the same name. Hence, here you can actually download version 7 of Numark CUE. Numark, the company behind Numark CUE, is a professional DJ equipment manufacturer founded over four decades ago. Some say that in all ancient and modern cultures, technological advancements can be first seen applied in the military than in music fields. Whether that’s completely true we won’t debate here, but we’ll can confirm over the last decades a revolution which might be called digital music has been, and still is, changing the way we make music, distribute music, listen to music and so on. As such, you probably know the modern DJ nowadays no longer just depends on two turntables for spinning vinyl and mixing the music, but uses controllers and digital music tracks, video clips and other items to contribute to the party atmosphere. Back to Numark, which in 2001 acquired Alesis, an audio hardware manufacturer and in 2012 Numark itself was acquired by InMusic Brands, the parent company for other renown brands in the music production, DJ, live sound, pro audio, musical instrument and consumer electronics industries, such as Akai, Denon, M-Audio, Marant, MixMeister, and more.